We live in a time of uncertainty. Who are we? What is our purpose? And if no one Instagrams brunch, did it really happen? These are the questions of our time (okay, some more pressing than others), and recently I took the initiative and gathered up another intrepid group of Prague gastronomic adventurers (a.k.a. my friends) and set out to answer one of them. Unfortunately, it wasn’t the “meaning of life” one — instead, we set our sights a bit more realistically and began a quest to discover some of the best spots for brunch in Prague. While in many cities, brunch has exploded into a must-do weekly event for any self-respecting urbanite with a bevvy of friends, here in Prague, breakfast and brunch have had a much slower start. 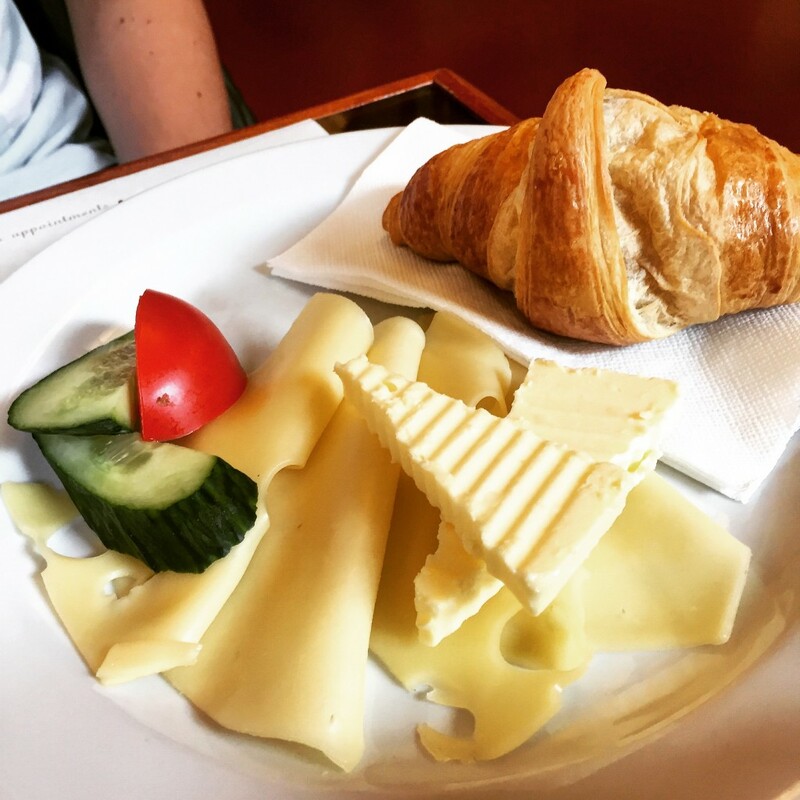 Here in the Czech Republic, breakfast is less of an event and more a simple meal of cold cuts, cheeses, bread, and possibly some eggs to start one’s day. But lately, that’s all changing and Prague is ready to take its place as an internationally trendy, brunch-lovin’ European capital. The first stop on our virtual tour of Prague brunches is unique for two reasons; Radost FX is one of Prague’s few (but growing) vegetarian-only restaurants, and its premises are on the upper level of a famous music club of the same name (fun fact: Rihanna shot the music video for her early hit “Don’t Stop the Music” here). So whether you’re embracing a meat-free existence or are just a huge pop music aficionado, Radost (as its name is shortened by locals) is the place for you (and for those die-hard carnivores out there, their menu even includes fish — though to be honest, the food is so good, you won’t even notice the lack of meat on your plate). Known for its slightly psychedelic, groovy interior that I can only really describe as inspired by the inside of Jeannie’s lamp on I Dream of Jeannie or Genie’s in Aladdin (it varies), Radost is located close to the metro stop IP Pavlova, making it part of one of Prague’s hippest international neighboruhoods. That also means it’s close to some of our favourite haunts like Náměstí Míru and Jiřího z Poděbrady, which makes it the perfect stop either before or after a morning/afternoon of exploring one of Prague’s gems of a neighbourhood. It’s also a handy location and close enough in proximity to the city centre for walking off your meal, which, trust me, you’ll need. Radost’s menu ranges from a selection of classic omelets, TexMex specialties like huevos rancheros and burritos, bagels, classics like waffles and pancakes, and a truly impressive menu of beverages — both alcoholic and “non” — to keep you hydrated (especially if you’ve spent the previous night sampling the brews of the Czech Republic). 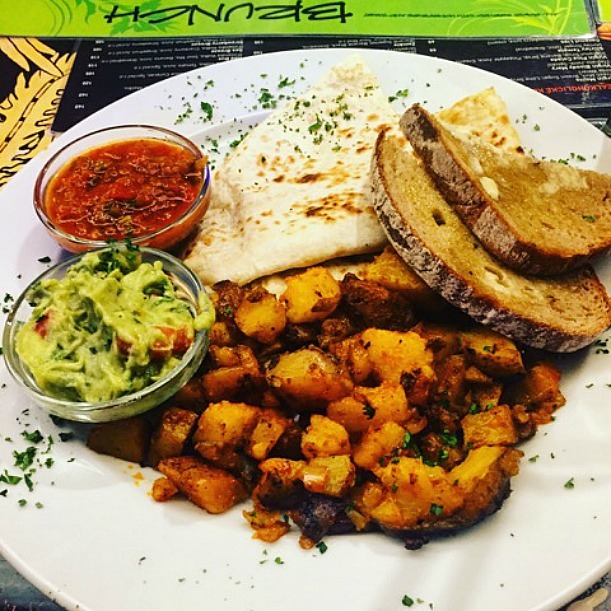 While “bottomless brunches” really aren’t a thing here in Prague yet, with alcohol being so affordable, you’ll be in no danger of going broke if you choose to go the booze-y route with your brunch. For those who don’t wish to partake in alcohol during the most important meal of the day, Radost also offers a selection of juices, virgin drinks, giant teas, carafes of flavoured “sissy water” with mint and lemon, and even a great filtered coffee offer that comes with two refills, which, as a huge lover of coffee myself, is about the amount of caffeine I need in my bloodstream so that I can change from the amoeba-like creature I wake up as into a functioning member of society. The true star of Radost’s brunch is the food — of which in my many late morning/early afternoon trips I’ve never had a bad dish. The burritos, the omelets, and the breakfast sandwiches are all delectable, but what I really love is the cheese quesadillas, which help satisfy my constant craving for cheese and Mexican-style food (the quesadillas come with salsa, sour cream, and, most importantly, the holy grail that is guacamole). My favourite part of brunch at Radost, though, has to be their homefried potatoes, which I would quite happily eat for the rest of my life. My friends have since given up trying to stop me from waxing poetic about them (literally — I may have once made up an impromptu limerick of which they were the star), but let me tell you, if it were possible to pick one perfect potato dish among all of the gloriously tasty potato dishes in the world, these potatoes are at least in the top 10 — maybe even higher. The icing on the Radost brunch cake is the wait staff, which is remarkably friendly and always offers up recommendations with a smile. 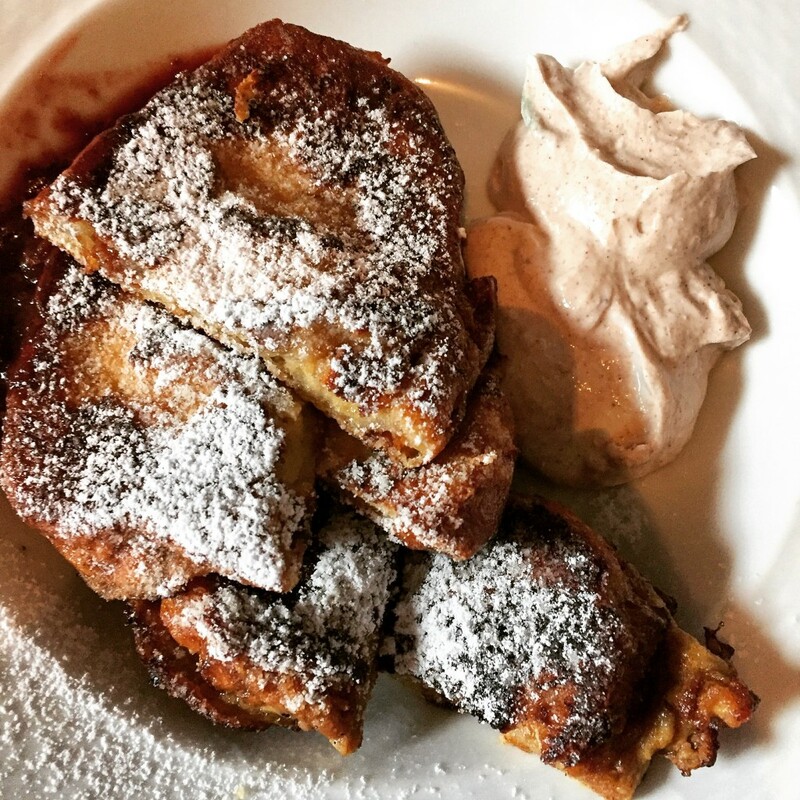 Radost, while nothing super-fancy, is a staple in Prague’s brunch offerings. We’re going from one extreme to another here, switching from Radost’s laidback vibe to the almost opulent, old-world atmosphere of Café Louvre. Louvre, which is named after the world’s most famous art galleries, is an institution of its own and has been serving up coffees and cakes, and acting as a cultural melting pot since 1902, with a slight pause in its service due to the 1948 communist coup d’état (which involved tossing all of the café’s fixtures out of a window onto the street). Café Louvre has played host to generations of Prague intellectuals such as Franz Kafka, Max Brod, Czech writer Karel Čapek, and even the first president of Czechoslovakia, Tomáš Garrigue Masaryk, so you’ll be brunching among fantastic historical company. But what really sets Café Louvre apart from many other brunch spots in Prague is its décor, which is pretty much straight out of Imperial Prague. When you walk in, you get the feeling of being transported back to the past, almost as if you might look up and see Kafka and Brod arguing over literature at the table next to you. Because of this, it’s a popular spot with locals and visitors alike, so you may have to wait a bit for a table, but the staff does their best to fit everyone in and the line is generally not too long. I personally like to take in the grand setting and daydream of all of the people who must have passed through its doors as I wait. The food at Louvre is classic and done well, and the menu is varied, making it pretty certain that you’ll find something that tickles your fancy. One of the stars is probably the “complete breakfast” menu where they have a few different selections like a “Czech Breakfast” involving bread, cheese, eggs, and cold cuts, and a “Cowboy Breakfast” involving bacon/sausage/ham and eggs, in a more American style. Café Louvre also has another page of different breakfast items like eggs, omelets, pancakes, and toast that you can mix and match to create the fantasy breakfast of your dreams. When I sampled their fares with a friend, we took the slightly gluttonous, but time-tested approach of ordering a number of different items from the menu and splitting them between us (we’re also unbelievably indecisive, so this was kind of a win-win). We started off with the slightly odd brunch item (but classic Czech option) of liver dumpling soup. Now, the name tends to scare visitors, but if you’re up for trying something tasty and regional, this is the way to go. The soup tasted just like how I remember my grandmother’s homemade soup tasted, so it gets my seal of approval. 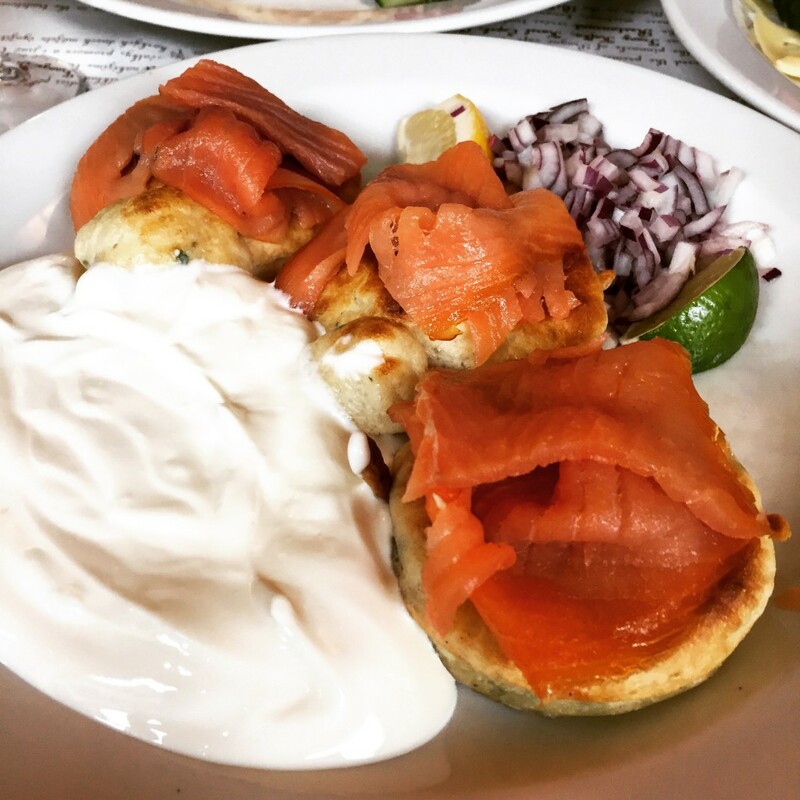 From there, we embarked on an adventure with the “Northern Breakfast,” which consists of savoury pancakes topped with smoked salmon, chives, and sour cream. It was luxuriously delicious and the fact that it was served with glasses of sparkling wine made us feel like we were the fanciest people in the world, which, considering I had just rolled out of bed and was decked out in combat boots, was no small accomplishment. Sparkling, in case you’re wondering, goes perfectly with the cups of coffee we also ordered to get our morning doses of caffeine. The second selection of breakfast foods we ordered was the French Breakfast, which included a cheese plate, ham omelet, and one of the most deliciously buttery and flaky croissants I’ve ever had the pleasure of encountering. In short, no matter what you choose at Café Louvre, you won’t walk away disappointed. It’s the perfect place for when you want to feel a little fancy, fantasise a bit about being in all the “right” social circles in the 1910s and ’20s, and also chow down on some delicious dishes. The Farm — which is located in the trendy, much-loved neighbourhood of Letná, surrounding the eponymous park (which, incidentally, is one of our very favourites due to the cool views from the beer garden it contains during the summer) — is pretty much everything you could want out of a hip brunch location. The décor is modern, with large, bright windows and a kitsch-y, handmade feel where the seats are chairs one might find at the outdoor portion of a chic café and a chalkboard announcing daily specials dominates the main wall. Overall, the feel is that of a converted warehouse, which is relatively popular here in Prague, though it maintains a warmth that is sometimes lost in such big, open spaces. What The Farm really excels at, though, is providing a farm-fresh (hence the name) brunch menu for a good price that suits locals and visitors alike. Their whole motto is that they use only Bio and Fair Trade ingredients to serve up not only delicious, but responsible meals, pastries, and coffee — it’s a motto we can really get behind, and, if the weekend brunch crowd is any indication, so can the fine people of Prague. Boasting a menu full of breakfast classics like French toast, pancakes, and bacon and eggs, as well as some great burger and sandwich options, The Farm has something for even the most particular of eaters. 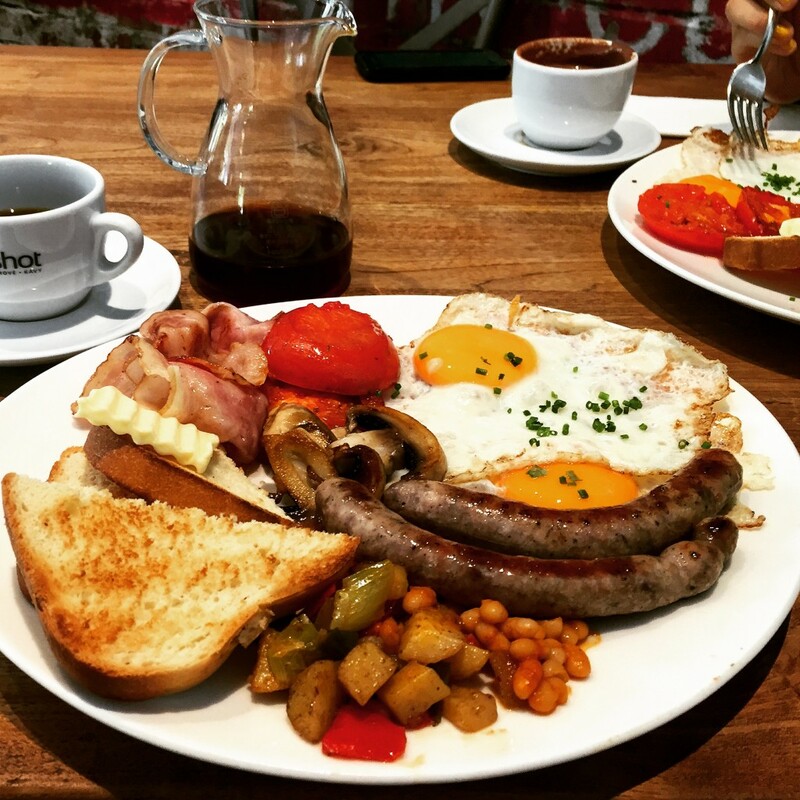 If you’re not hungry for something heavy, they also serve up a selection of smaller dishes like porridge with fresh fruit or Italian-style eggs Benedict, delicious-looking cakes and cookies, and, of course, some amazing coffee. On my numerous brunch visits (locals LOVE this place, which is why we’re sharing), I’ve had the joy of sampling the gamut of the menu, but for those who are craving a classic breakfast for their brunch, there’s no better option than “The Farm Breakfast,” consisting of fried eggs, bacon, fresh bread, and a local cheese. If that still doesn’t satisfy your appetite (or you’re just not feeling the whole savoury-bunch-type-thing), I’d also recommend the pancakes or French toast topped with berry preserve — your taste buds will thank you! You can opt to have them topped with maple syrup, if you’re a die-hard fan of the sweet, sappy condiment, but the standard creamy, cinnamon-y, yoghurt-y topping that comes standard with them practically renders the maple goodness excessive, which, as a native Northeasterner, I never thought I’d ever admit. While there’s always a chance that you can snag a table on most weekend mornings, if you’re heading in with a slightly larger party, I’d recommend making a reservation first. If, on the chance that you show up on a whim and the place is bursting at the seams with patrons, don’t worry — the staff (all of whom speak fantastic English) are super friendly and informative and will try their best to either fit you in or tell you exactly when they might have room for you. Rather than a busy, hectic restaurant, the staff at The Farm do their best to make you feel less like a customer and more like a valued friend or beloved family member even on the busiest Sunday morning. Located in the heart of Karlín, Můj šálek kávy was already on my radar as one the best coffee shops in Prague, thanks to practically unanimous love from the whole Prague Urban Adventures team (check out Travis’ review of it on our list of top cafés in Prague), which is why once I found out they were popular with the brunch crowd, I was immediately excited. After hearing through the food-loving grapevine that it was hard to snag a table, I even went so far as to reserve us a spot ahead of time using their handy-dandy table request service on their website. If you know me and the contempt I hold for most types of forethought, this speaks volumes as to how down I was for this gastronomical experience. Since it was a nice morning when the brunch crew arrived, there was actually an abundance of seating thanks to the outdoor tables, but on a cooler day this type of forethought might have been imperative (Praguers love their table reservations, in case you didn’t know). The interior of Můj šálek kávy is bright, homey, and modern — especially with the colourful exposed brick accent wall that’s been painted with their logo and an apt coffee cup, which lends a bit of funky character to what otherwise could have been standard café décor. The furniture is a mix of gleaming, sturdy tables, matching chairs that are all varying shades of one another, nooks of fashionably aged and distressed wooden benches and tables strewn with cushions, and even a few lower tables and armchairs. In my mind, the interior is exactly the sort of warm, cosy atmosphere that you might expect from a hobbit hole — you know, if the hobbits who lived there were particularly up on urban fashion. The weekend/brunch menu here is small compared to other locations in Prague, but honestly, the offerings are so good that that hardly bothered us. For our trip, the brunch crew was atypically small, made up of just me and one other friend, and while there were a few order options we were batting back and forth, we both opted to go with the English breakfast, which appealed to my post-Czech-beer morning after (hey it was a typical Sunday in Prague). The breakfast, which was a proper full English fry-up with beans, fried tomatoes, mushrooms, eggs, buttered toast, and bacon was in short, perfect. I’d also describe it as glorious, and, after checking with my friend, was assured that it wasn’t just my mild hangover talking. Like any coffee shop worth its salt, Můj šálek kávy offers up a series of delicious caffeinated and non-caffeinated beverages that would make visiting the shop without ordering any food more than worth it. After deliberating for a while over which type of filtered, drip coffee was best, I got a recommendation from our waitress, who clearly knew her way around a coffee bean. Our remaining brunch explorer chose to go the way of decadence and comfort with a hot chocolate that looked so rich and delicious, it made even my caffeine-addicted brain second guess my choice when it arrived. As we left Můj šálek kávy, we lingered by a display case full of mouth-watering pastries, cakes, and cupcakes, which I later found out are made from a small, local bakery and prepared fresh. While we would have liked to have been able to grab a piece of baked goodness or sampled a cupcake, the consensus was that we were still too full from the excellent brunch, meaning that Můj šálek kávy remains on our respective lists of places deserving a return trip. La Bottega Gastronomica: pricey, but beloved for their eggs Benedict. The Globe: favourite of the expat crowd, may be the first place in Prague to make brunch a thing. Bohemian Bagel: another expat fave, our most-famous bagel shop. Fraktal: funky pub/restaurant with a surprising selection of awesome international food. Café Sladkovský: a Prague Urban Adventures favourite in Vršovice, named after a famous Czech vegetarian — EVERYTHING they do is fantastic! Are you up for the best beer and culinary tour in Prague? Then let’s go! Let us lead you on this tour of the most reputable (though not always the most beautiful) beer sanctuaries in the city.